In mid 2009, while watching a video of a classical Indian dancer, I was introduced to a new dance form, Odissi. My initial reaction, having very limited knowledge about Indian dance in general, was one of mixed thoughts and emotions. While delighted and charmed by the presentation, there was a sense of intrigue and curiosity as to why and how this american girl was representing this dance form. Having studied and performed several international dance styles myself, I understood how dance and culture have synonymous qualities no matter what part of the world we are in. It was then that I decided to explore the possibilities of learning the dance! Initially, my knowledge about Odissi dance was very limited until I began to do more research on its origins, its spiritual roots, and its revival. I discovered that since its birth, Odissi has always had a deep rooted relationship with religious beliefs, and has dramatically evolved with cultural and political changes over time. At present, this dance is experiencing a renaissance in terms of how modern audiences and dancers are admiring it. Many are wanting to learn and practice the dance and experience all that this mystic art has to offer, thus, changing how Odissi is growing on a global scale. Currently, there are thousands of Odissi gurus (teachers), who have gained vast amounts of knowledge through their predecessors, and have passed it down to their disciples. This tradition is known as the Guru-Shishya Parampara. In December 2009, I flew into India for the first time and was ready to venture out to Rajasthan. It was almost impossible to contain my excitement as I was about to embark on a new journey in my dance education. Indian culture and concepts had already played an integral part in my profession and self development through yoga, music, and art. I was ready to explore the art of Odissi, while discovering and connecting with this culture. I chose to travel to India and engage directly with the source. I arrived on the 11th of January 2010, and I spent one month studying the basic elements of Odissi. My days began by arriving to school at 8 in the morning with an offering of fresh flowers and participating in morning darshan (prayer) to Lord Jagannath, a Hindu deity worshipped primarily by the people in the state of Orissa, where Odissi springs from. We practiced a series of warm up and stepping exercises which were imperative to help build up stamina and muscle power for the demands of each day. Some days were so intense, it felt like I would not get through the entire practice without collapsing to the ground. By the end of the month, my body had undergone a great transformation, and I felt empowered, not only on a physical level, but a mental one as well. In the noon time, we learned the first item of the Odissi dance repertoire, the “mangala charan.” It is an invocatory piece which is performed in sections, regarding Mother Earth, the Gods, the Guru, and the Audience. 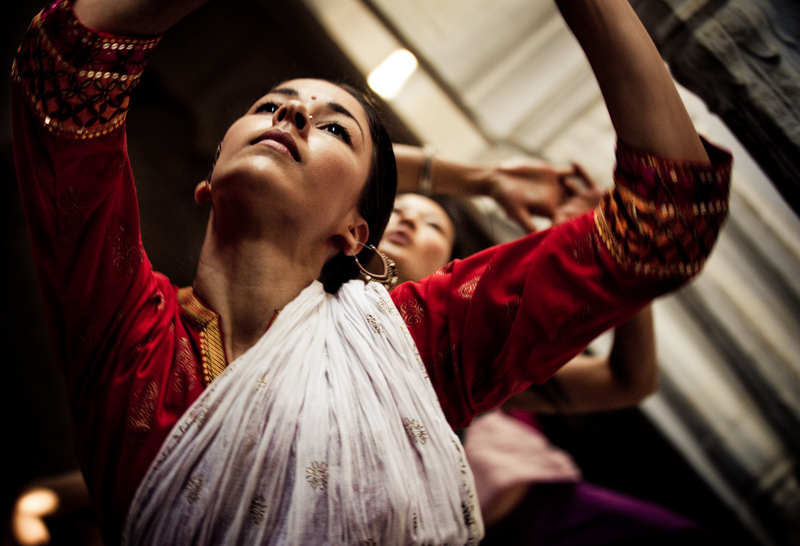 With deep spiritual intention, the dance expression was once an offering and served as a means for the dancer to connect with the divine and feel closer to God. My life has never been a life of “spiritual service,” yet, I have always resonated with the idea of a “divine” source that connects us all. The only thing I have ever devoted my life to, is dance, and through dance I have been able to find the peace and joy (bliss) that others seek and find through religion. Hence, my religion is dance! Just before dusk, we gathered once again, and discussed the roots and aesthetics of the dance, practiced hasta mudras (hand gestures) along with upper body movement including the eyes, head, and torso. Odissi is a dance which displays great attention to detail, through which the dancer evokes Rasa (meaning to give aesthetic delight) in its spectators. Having studied and performed Polynesian and Persian dances in my earlier years, I was familiar with the significance and concept of “Abhinaya” (expressional/dramatic dance), using hand gestures and facial expression to convey a message, thus leading to Rasa. Throughout this intensive, I gained both practical and theoretical experience strongly based on the thorough teachings of my Gurus. Before this trip, to me, exploring Odissi was an interesting, yet distant opportunity. During my 15 years of traveling, learning and teaching dance, this venture has given me a new understanding and perspective of how dance and spirituality are strongly connected. I am now confident with this new sensibility and will surely pursue this particular art form in the future. I strongly recommend Odissi to those who are on the verge of seeking to enhance their all around dance experience. I was presented with an opportunity to go to India and be a part of the Real Divine project, a collective of artists committed to using art to empower and support underprivileged children in South Asia. Initially, the idea was for me to assist in the art classes. After meeting with the children and the organizers I began to realize that I could offer much more than general help. Therefore, with the staffs assistance and support, I began to organize a range of classes for the various ages of children. 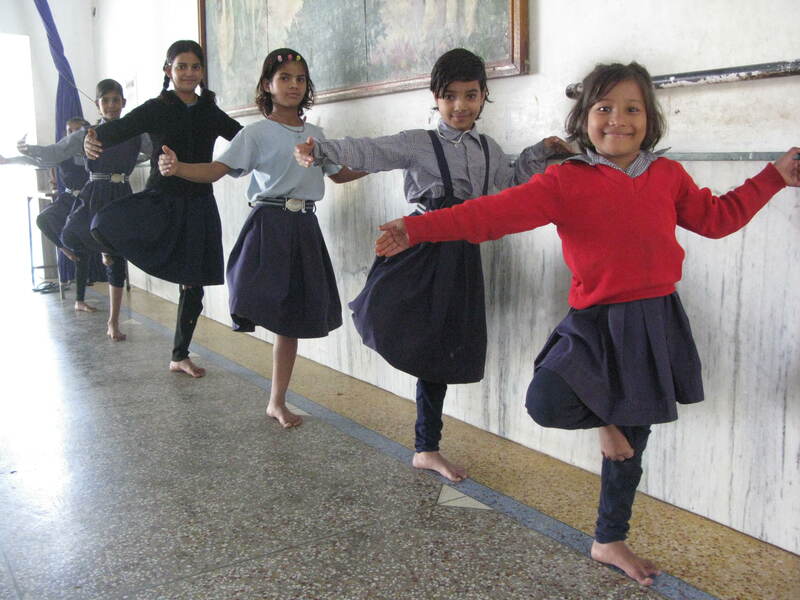 Dance in India, specifically, is part of every curriculum and most families tend to want their daughters to learn Kathak, Bharatanatyam, or Odissi. During the first few days, I realized that the children had difficulties with basic english language (related to dance), and were also in need of a different type of physical stimulation. With years of classical ballet under my belt, I was excited with the idea of introducing a western genre into the lives of these children. They experienced the discipline of ballet and were intrigued with its “odd” range of movement. To my surprise, while sharing my experiences, the children began to gain simple language skills and were able to communicate with me both physically and orally. Because everyday communication was still a great challenge for me, not knowing the least bit of the native language, I took it upon myself to join a Hindi class and acquired some basic everyday conversational skills. Aside from teaching language and dance skills, spending quality time with the children was precious time which made a profound impression. These children are considered to be the “poorest of the poor” in the vicinity of Vrindavan, the sacred town where the school is situated. Through sponsorship they are provided with the means to receive basic education, clothing, medical attention, and a meal per day. As a volunteer, my interaction with the children was quite simple, and I was able to provide them with some extra love and attention by spending time on the playgrounds, eating together during the lunch hour, and dancing, of course. I was also fortunate enough to spend a great deal of time with a very special group of young talented artists which were chosen to be a part of the Real Divine project. It was an honor to be welcomed into their homes and with meet their families, as they demonstrated strong family values and work ethic. I traveled to Vrindavan in hopes that whatever I had to share would have a positive influence and serve as a source of inspiration in the lives of these children. In return, I gained friendship and the inspiration to always maintain humility and love in my heart . Dear Sonia, you are amazing .the more I know about you the more you inspire me .you are a real source of positive energy. In return, I gained friendship and the inspiration to always maintain humility and love in my heart …perfectly put. See you there again one day i hope.